'The Trial of Queen Caroline', as it is almost universally known, was in fact not strictly a trial at all but a discussion on a Bill of Pains and Penalties amounting to an inquiry into the Queen's conduct during her wanderings abroad as Princess of Wales. It was hoped, by the Prince Regent at least, that the case would provide the evidence to enable him to divorce her. The evidence certainly materialised in much squalid detail but the 'trial' was adjourned for political reasons, Caroline was debarred from the Coronation in Westminster Abbey and died a fortnight later. It was a political event of considerable significance and drama frequently descending into farce but always maintaining an element of the spectacular which George Hayter was to exploit. Unlike Hickel's picture of the House of Commons in 1793-4 (NPG 745), and indeed Hayter's own picture of the House of Commons in 1833 (NPG 54), the 'Trial' was commissioned. Hayter had the good fortune to find a patron in George Agar Ellis, a rising young Whig politician sympathetic to the Queen's cause, a man profoundly interested in the arts, a Director of the British Institution, and a few years later to become the moving spirit behind the purchase of the Angerstein Collection, the nucleus of the National Gallery. Agar Ellis appears as a key figure in 'Patrons and Lovers of Art' (see NPG 792-5) and was later created 1st Baron Dover. The picture was acquired from his descendants in 1912. I have sent you a rough list of the Peers who I think should form part of the picture. - I have divided them into two classes - those who must be & those who may be in the Picture - of course subject to any revisions or alterations you may suggest ... I have written to Mr Denman this morning, & have desired him, if he will sit, to let you know it. - I have also requested him to speak to Brougham about it. Most of the 80 names listed by Agar Ellis appear in the picture and more were added later reaching a final total of nearly three hundred. 1. very few sparkling touches of light on the embroidery of the Throne. 2. Bishops Wigs are darker than the councellors, cravats much whiter than wigs. 3. The light descending from either side, casts strong & broad shadows on either opposite side, in the right hand corner of the right Gallery the heads are with broad shadows & sharp light from the opposite side and shadows from the rail broad and deep [sketch of figure leaning on rail]. 4. The Heads on the right under the Gallery in full light from the opposite side but shadows soft. 5. The end of the benches in the Galleries not bright from being nearly perpendicularly under the window [small drawing of seated figure]. 6. Great general difference in the tones of the reds all through the furniture of the House. 7. Heads in the middle of the House, in quiet masses of broad half tint & quiet descending light. Yet all receeding features in full dark shadow [sketch of Lord Eldon's head]. 8. on the left side of the House the shadows with more point than on the right [sketch of a head] in the forenoon. 9. the shadows of heads &c frequently absorbed & lost in objects behind, or on the drapery -. 10. All the heads in the right corner beyond the Gallery much lower in tone, than those immediately under the Gallery. 11. The heads under the Throne with sharp clear light on the upper part & the lower parts in half tint & shadow. All heads leaning forward at the Throne loose all light. 13. features not visible beyond the Chancellors but in Masses. 14. Top of the Chancellor's wig whiter than any near it. 15. All the line of Shadow, from the Gallery on the red wall very soft. 16. the light on the brass brighter than any other object. In spite of these aids the difficulties were formidable and Hayter emphasises them in the Introduction to his Descriptive Catalogue: the need to adhere strictly to the shape of the House of Lords, the benches and galleries on either side forming ten parallel lines, the cross-benches at right angles, the table at which the Lord Chancellor sits 'is sunk into a sort of well in the floor, and the woolsacks are so placed that their Lordships, the learned Judges sitting on them, were scarcely to be seen'. Then there were the harsh upright lines of the brass columns supporting Soane's galleries specially designed for the occasion; and finally light entering from six opposing windows 'which rendered it almost impossible for a painter, who did not, by partial or political feeling, determine to sacrifice one or the other side of his picture to shadow ...' (Descriptive Catalogue, p v). Mr George Hayter presents his most respectful compliments to the Earl of Liverpool. He is really sorry to intrude this troublesome note upon his Lordship's time - but understanding yesterday that Mr Arbuthnot had had the kindness to explain to Lord Liverpool the state of his picture and the great advantage which would be derived from Lord L-- condescending to give Mr G H a short sitting, now that he has made his utmost use of the sketch he had the honour to be permitted to make at Fife House. If Lord Liverpool can do Mr G H the favor to name any hour in next week, or on Sunday, which would be less inconvenient than another to his Lordship Mr G. H will be highly obliged & most grateful. The Royal Dukes gave him sittings and Agar Ellis was also helpful as we have seen and Hayter declares that this 'zealous anxiety for its advancement and success enabled him to overcome the almost insurmountable difficulties of obtaining the favour of sittings ...' (Descriptive Catalogue, p vi). The artist's choice of occasion is interesting and revealing - or was it Agar Ellis's choice? The view is a diagonal across the House looking towards the throne, and the moment chosen is on the sixth day of the trial, 23 August, when the witness Theodore Majocchi was being cross-examined by the peers. The Whig leader Lord Grey stands in dramatic attitude, arm outstretched, trying to check the flow of verbosity from Spineto, the interpreter, who numbers off points on his fingers beside Majocchi. Lord Holland stands behind Grey. The Queen seated on an elegant Regency chair, with a footstool, listens 'in an attitude in which ease and defiance were nicely blended' (Roger Fulford, The Trial Of Queen Caroline, 1967, p 46). Around her are grouped leading counsel of both sides, Tindal, Williams, Wilde, Denman, Lushington and Brougham, all for the Queen, being central figures. Focal points are J. S. Copley, the Solicitor-General, to the left, the Duke of Clarence standing in the left gallery, Wellington below him, the Earl of Derby sitting in the right gallery and below him Agar Ellis, the moving spirit of the picture itself, with the artist standing in the right corner. The general effect, in contrast to the static formality of Hickel's 'House of Commons of 1793', is a scene full of movement and animation. At this time their Lordships were occupying the old Court of Requests, an ancient Gothic chamber in the Palace of Westminster which had been altered by Wyatt into, as described by his contemporaries, a stable in 'beastly bad taste', with 'more the appearance of a cotton-mill', and 'that august pile of brickbats and stucco' (King's Works, VI, 1973, p 517). These judgements may have been tainted by professional jealousy though not for nothing was Wyatt known as 'The Destroyer'. The view however is interesting in showing Wyatt's windows and ceiling, his sumptuous new throne, the magnificent brass chandeliers, Soane's galleries specially set up for the occasion, and behind them the Armada Tapestries commissioned by Lord Howard of Effingham and acquired by James I. It was in a room above here that the fire began which destroyed practically the entire Palace of Westminster in 1834. Hayter's picture took two and a half years to paint and as he exhibited nothing at the Royal Academy nor the British Institution during this time it must have occupied him throughout. He was still having sittings early in March 1823 (as the letter to Lord Liverpool quoted above shows) but it was ready for exhibition at the end of March at Mr Cauty's Great Rooms in Pall Mall. By this time George IV had enjoyed a resplendent Coronation, the Queen had died and memories of the trial were fading, but the opening of Hayter's exhibition was attended by a glittering crowd of princes of the blood and the nobility and the establishment. They were able to buy for one shilling Hayter's Descriptive Catalogue with reference plates and a key identifying 189 figures. 'Portraits of the most illustrious and distinguished personages of the kingdom abound throughout', said The Morning Chronicle, and The Times in a long and lavishly complimentary review, clearly written by an admiring friend if not by the artist himself, declared that all the portraits were striking likenesses and 'by a judicious arrangement of the perspective lines, by a beautiful gradation of tint, and an extraordinary degree of relief and aerial effect, he has succeeded in producing a picture which, for a faithful imitation of the appearance of nature, has probably never been surpassed' (The Times, 31 March 1823). Other papers were favourable if less effusive. I find it so inconvenient admitting persons to see the picture here without tickets, that I have given my Porter orders to admit no one in future unless they bring a ticket. I therefore send you some, to give to any of your friends who may apply to you - you will be so good as to put the day of the month under the word Wednesday - that it may specify what Wednesday - & your friends must attend to the notice about wet or dirty weather -. Agar Ellis was created 1st Baron Dover in 1831, and lived at Dover House, Whitehall (later called Melbourne House and now the Scottish Office) until his death in 1833 aged 36. 'The Trial' passed to his son and heir Henry Agar Ellis, 2nd Baron Dover and 3rd Viscount Clifden, then to the latter's only surviving daughter Lilah Georgiana who married the 3rd Baron Annaly. From him it was placed on loan to the NPG in 1895 and hung there, despite several attempts by the First Commissioner of Works to appropriate it for the House of Lords, until 1912 when it was bought from Lord Annaly by the National Art-Collections Fund and presented to the NPG. It is a long while since I had the pleasure to hear from you ... I long very much to know the state of the plate of "Trial of The Queen". I long to see an etched proof. I long to read your opinion of its progress, and to have the gratification, as we are so near, of assisting its progress, if it lies in my power! I am much obliged to you for the proofs of the Engraving of the Queen's Trial, which are admirable. You will oblige me by letting me have a copy of the Key, not mounted, so that I may frame it & place it with the original picture, as I have nothing of the kind. I have been ill or you would have heard from me sooner. The engraving was published in 1832. The delay was possibly caused by the publisher himself not wishing to queer the pitch for a project of his own - an ambitious folio published in 1823, An Impartial Historical Narrative of those momentous events which have taken place ... during the period ... 1816 to 1823. Among its illustrations was a stipple engraving by George Murray from a watercolour painting by Stephanoff, Pugin and Bowyer himself, now in the House of Lords. A companion watercolour by the same artists shows the House of Commons debating the difficult problem of voting a grant of money to the Queen (see R. J. B. Walker, Catalogue of Paintings etc in the Palace of Westminster, II, 1960, pp 135a-b). Murray's engraving of the trial shows the House of Lords from a slightly different angle to Hayter's and with no attempt at portraiture. Hayter followed the trial picture with a similar project, 'The Trial of Lord William Russell', a 17th century subject commissioned by the Duke of Bedford and now at Woburn Abbey. This led to 'The Coronation of Charles X', for which only an oil sketch materialised, and finally to his monumental 'Reformed House of Commons 1833', NPG 54 catalogued in Richard Ormond, National Portrait Gallery: Early Victorian Portraits, 1973, pp 526-36. Hayter's original key for the 'Trial' was so excellent that it has been used, with a few modifications, in this Catalogue. Key numbers follow the names in the list below, which includes every known sitter in the picture. Those marked with an asterisk [*] appear in the main Catalogue. Roger Fulford, The Trial Of Queen Caroline, 1967. George Hayter, A DESCRIPTIVE CATALOGUE of the Great Historical Picture representing the Trial of Her Late Majesty QUEEN CAROLINE OF ENGLAND ..., 1823. The Englishman, 30 March 1823. The Examiner, 7 April 1823, p 234. RA library: RA Catalogues (Basil Jupp), XIII, 1824, pp 19-20. I am indebted to Richard Ormond whose work on the picture is in the NPG archive. 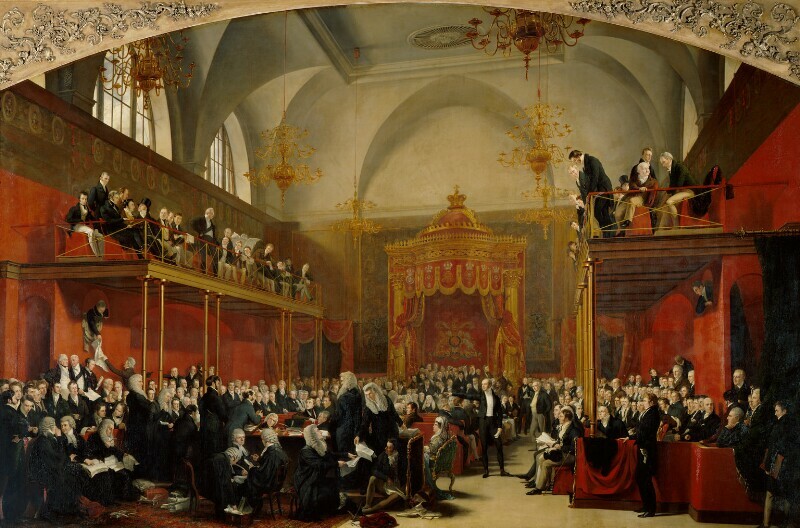 Hayter's picture represents the interior of the House of Lords during the discussion in August to November 1820 of the Bill to dissolve the marriage between George IV and his Queen Consort, Caroline of Brunswick. Commissioned by George Agar Ellis MP (later 1st Baron Dover), then by family inheritance to his granddaughter Lady Lilah Annaly; loan to NPG from Lord Annaly 1895 and bought from him in 1912 with help from the NACF. Mr Cauty's Great Rooms, 80½ Pall Mall, 1823. Mezzotint by J. Bromley, J. Porter and J. G. Murray, published Bowyer & Parkes 1832 with key-plate.